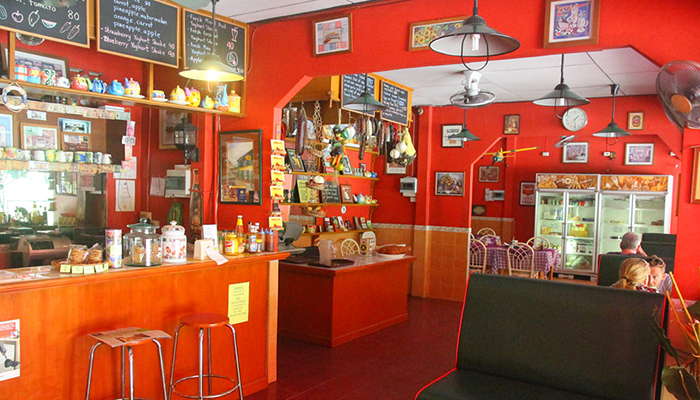 Angela’s Bakery draws a loyal crowd of expats and travelers on Samui, and for good reason. It’s likely you’ll find out why during your first visit to this well-loved breakfast haunt. The menu lists a good selection of Western breakfasts, pastries, sandwiches, quiches and desserts, making Angela’s just perfect for days when your tastebuds crave a change from Thai flavours. We’ve been told that the sausage rolls and apple pies are incredible – so now you know what you absolutely can’t miss out on when you make a trip here! You can’t go wrong with Sunday brunch at Nikki Beach. A weekly fixture on its events calendar, the aptly named “Amazing Sunday Brunch” offers an impressive feast. 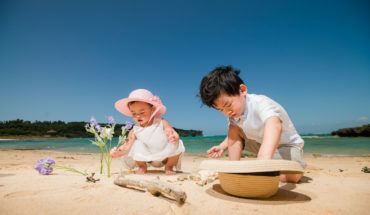 Come with an empty stomach, because you’ll need lots of space to sample over 40 dishes, ranging from breakfast favourites like waffles, crêpes, sausages and bacon, to heartier options like seafood, sushi and meat carvings. If you’re feeling fancy, start off brunch with a flute of bubbly (a complimentary mimosa or bellini is offered as part of the meal). 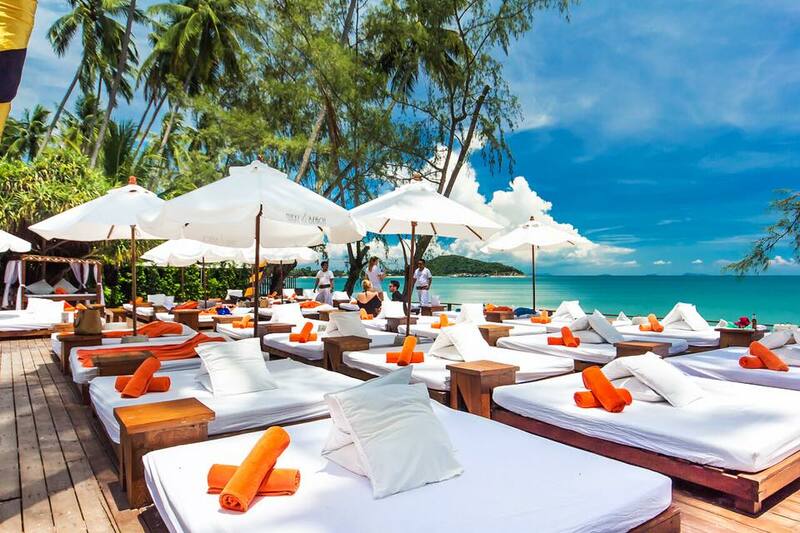 Nikki Beach’s lush compound – made up of towering palms, a turquoise pool, cushy daybeds and ample throw pillows – makes brunching here an enviable affair. Trendy travelers who adore chic brunch parties – decadent affairs that start off as a brunch, and slowly transforms over the afternoon into a pool party – will find what they seek at Beach Republic. Two infinity pools, regular DJ acts, live performances, a stylish decor and ocean views set the mood right for the venue’s Ultimate Sunday Brunch Club. A scrumptious buffet spread made up of meat carving stations, Thai dishes, sushi, cold cuts and crepes awaits. Breakfast at Koh Thai promises to be an indulgent affair. Set in an elevated spot above the hilltop, the restaurant offers views over the surrounding greenery and rugged coastlines. Indoor and outdoor seating are available; you’ll tuck into brunch in a finely appointed setting in the former, while the latter offers incredible vistas of the sea. The views and setting are charming, but the star of the show are the delectable specialties from all over the world. 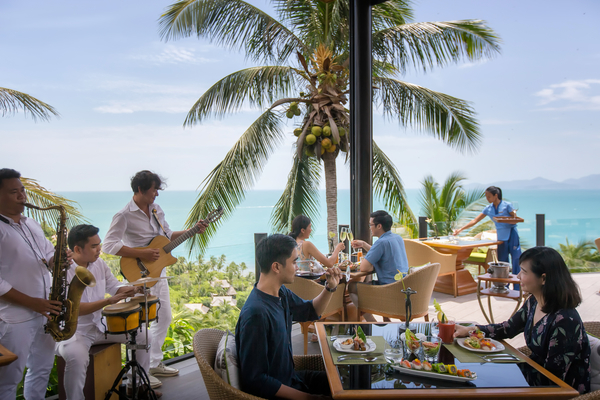 Koh Thai now offers an exclusive Sunday Brunch at Four Seasons Resort Koh Samui. Lobsters, meats, cheeses, pastries, homemade granola and freshly squeezed juices are some of the treats laid out on the expansive buffet table. Keep an eye out for the restaurant’s sumptuous daily specials, which includes items like pandan pancakes and Spanish omelette. The breakfast menu at The White Pearl may not be extensive, but you’ll find Western classics like the Full English breakfast, eggs with toast, muesli with fruit and yogurt and croissant with jam and butter. 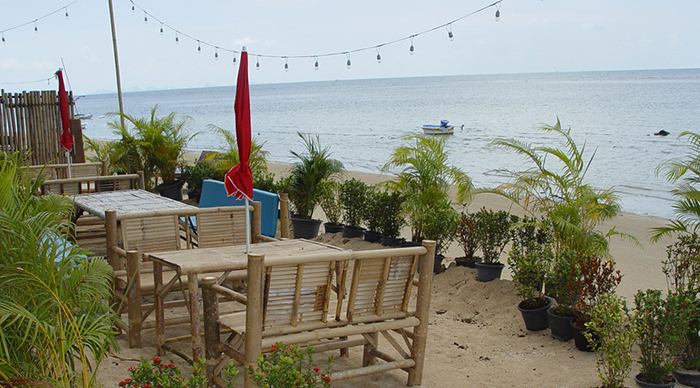 White wooden furniture and casual, unfussy decor create an ultra-relaxed ambience at this beachfront haunt. Take your pick from three different dining areas: indoors, outdoors or right on the sandy shores. Excellent hospitality from the hosts, Sean and Dang round out a lovely dining experience. 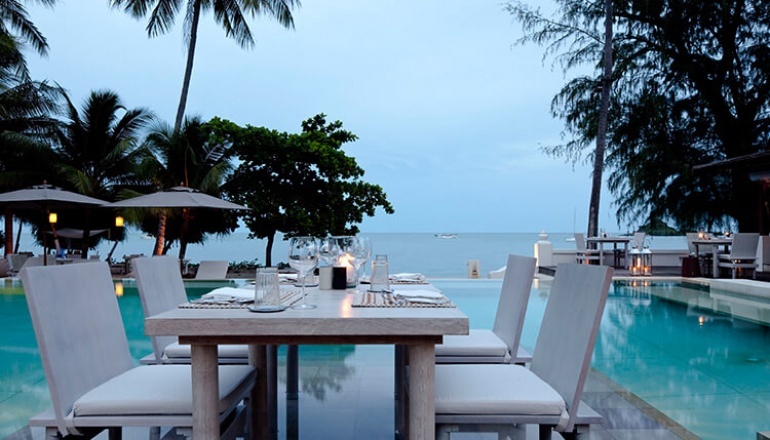 The refreshing sea breezes and ocean views are a welcome addition to any meal, and at SALA Samui Beach Restaurant you’ll enjoy these as you sit down to a delicious brunch spread. Guests have raved about the crêpes, coffees, smoothies and impeccable service. 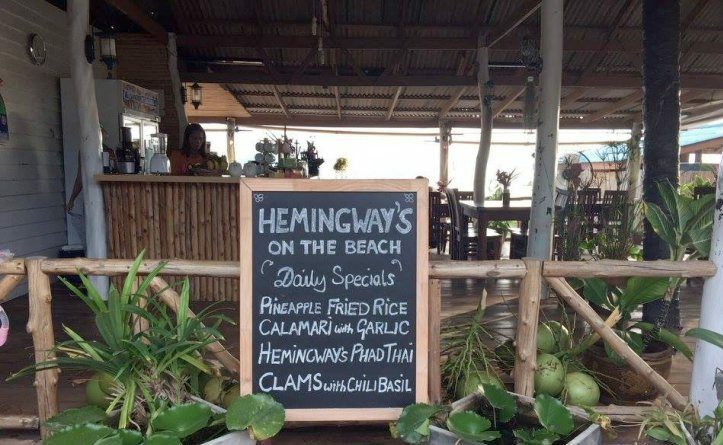 The beautifully named Hemingway’s on the Beach is nestled away along the quiet coasts of Thong Krut in Samui. The setting is informal (diners wander in barefoot) and laidback, and the indoor/outdoor design makes the best out of the restaurant’s picturesque surroundings. 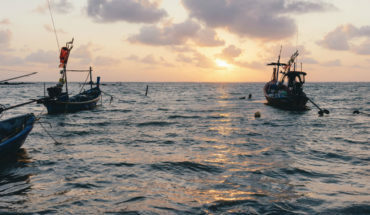 This is the place to go if you’re in the mood for savouring local fare; some of the tastiest plates of Thai dishes are served right from the kitchen, whipped up by the owner and chef Jaa. Don’t be in a hurry to leave after your brunch. 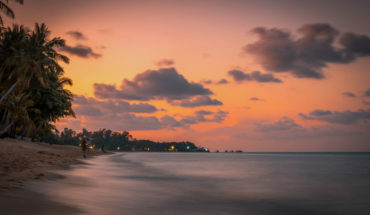 Step out to the coast and you’ll find a handful of recliners laid out upon the sandy shores, inviting you to sit back and relax with a cocktail or an ice-cold beer.